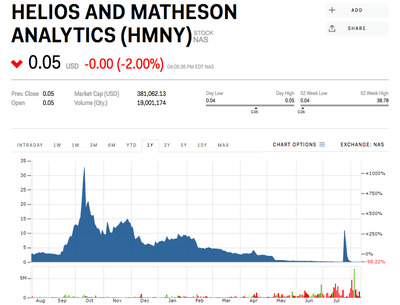 Robinhood is suspending new purchases of Helios & Matheson, the parent company of MoviePass, after the stock’s drastic 99.99% crash. 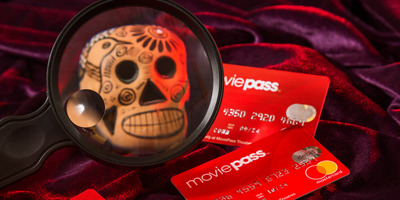 “In order to protect our customers from the risks associated with some low-priced stocks, we remove the buy option for stocks like HMNY that consistently trade under $US0.10,” the company said in an email to customers. Follow HMNY’s stock price in real-time here. Helios & Matheson, the parent company of MoviePass’, won’t be getting any new investors on Robinhood. The free stock-trading app said Monday that it would not allow users to buy shares of the company, but that they would still be able to hold and sell shares currently owned. “In order to protect our customers from the risks associated with some low-priced stocks, we remove the buy option for stocks like HMNY that consistently trade under $US0.10,” the brokerage said in an email to customers. Business Insider has reached out to Robinhood for more information about its policy for so-called “penny stocks” like HMNY, and will update this post if comment is received. HMNY has been wildly popular among Robinhood investors in recent months. More than 74,000 users currently hold the stock, the firm’s website shows, and it has consistently been one of the app’s most popular names since Business Insider first started tracking the data in June. It’s not clear when exactly the suspension will occur. An order for one share of HMNY was successfully placed via Robinhood by Business Insider shortly before the closing bell Monday. 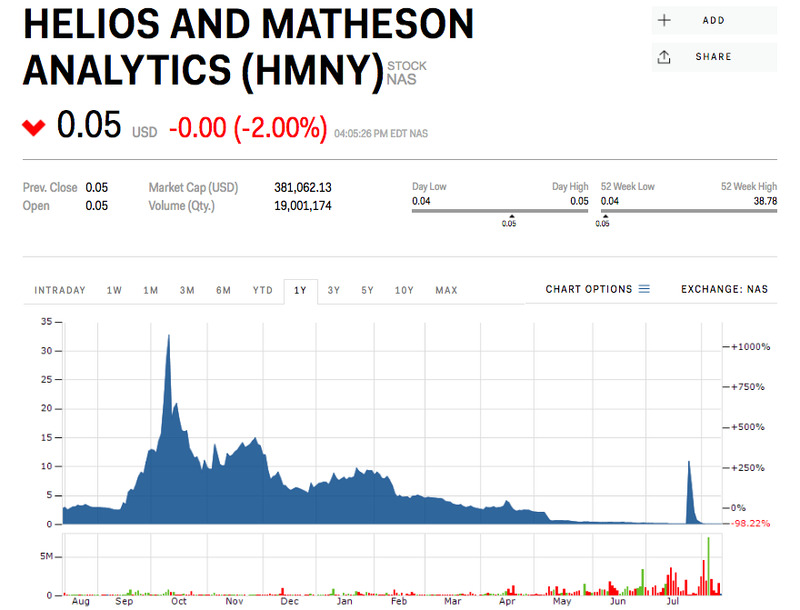 Despite a massive 1-for-250 reverse stock split in July, HMNY has declined by more than 99.99% in the past month and was trading at just $US0.05 on Monday. Adjusted for the reverse split, the stock was trading as high as $US8,200 when it first acquired MoviePass in the fall of 2017.